Just a quick note to let you know all our Easter plush is 40% off! We have some great brands and darling little guys just ready to sit in an Easter basket! Also, this weekend come in, crack an egg open at checkout, and receive 10% or 20% off your ENTIRE purchase!! OR 40% off one item! It's just a little way to say Happy Easter to our favorite guests. I came across this easy idea and wanted to share. 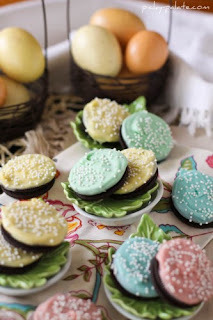 I LOVE oreo's with a passion - so I am definitely going to try these! Visit Picky Palate for instructions. Enjoy! 1. Choose a Color: For each child (or whomever you are giving to) choose one or two colors per basket. This gives each basket a different look and sets each child apart. Also it makes what could be a "cheap" looking basket look classy. 2. Always use a sturdy filler in the bottom of the basket before adding your gifts. Tissue paper, wrapping paper or wood excelsior make good fillers. Many people overlook this and then their basket doesn't look as full as it could. 3. After you are done assembling the basket, add a "place setting" underneath your basket. 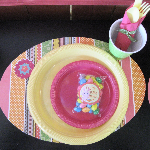 This can be a beach towel, a piece of cute fabric, an actual table placemat (we made our own placemat with an oval piece of card stock and then layered scrapbook paper on it) a balloon base, or even an article of clothing. It should match the overall theme... This will finish off each basket with a WOW effect! Did you get to watch Studio 5? If you are a new customer or haven't been our store before, these segments will give you a little taste of what you are missing!! We are going to be on KSL's Studio 5 show again, Monday the 6th! Callee will be presenting ideas on "Unique Ways to Wrap your Easter Present."